A really important part of the visit to Liuyang is to see product demonstrations. Every single night, I have been outside watching demos and you know what? It is bloomin’ freezing when you are sitting still for over an hour. Some factories specialise in just one type of firework, such as aerial shells. Others produce a wider range of materials and hence the demonstrations for these can be longer. The largest one I went to featured over 70 different fireworks and effects. 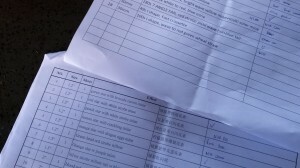 That’s a lot to take in and remember, and so we are given mark sheets. To a certain extent, it’s like being back in the classroom. After two or three demos, one’s brain becomes a bit saturated and so the group comes together to review and share thoughts on all of the material seen so far. We go through our notes whilst watching videos of the demos we’ve seen. The video is a really helpful reminder. The conversations are around the blend of effects and the markets that they are suitable for. There are three areas that we are looking at this week: Consumer retail goods, professional fireworks and stage pyrotechnics. The requirements of each are very different. For consumer material, we have to think about the calibre, height and burst diameter. We are also considering mine effects in cakes; stars that erupt from the ground around the main projectile to fill the lower part of the sky. There is a surprising difference in quality and spread – basically, you wouldn’t want to have too large a spread on a firework if it is intended to be lit by hand! We are also looking for symmetry of spherical bursts and consistency of height in multi-shot materials. This varied quite a lot for some manufacturers, something that I hadn’t really appreciated until now. Some of the more sophisticated factories have introduced detailed testing and analysis of the raw ingredients and finished powder mixtures. One factory that I visited has automated several of its processes, including installing a machine that fills cakes, ensuring that even the cardboard discs are all pushed in to the same level in every single tube. Both of these can have an effect on the performance height of a projectile. The group has some very detailed discussions about certain fireworks, freeze-framing the video and almost doing a frame-by-frame dissection of the effects. In some cases, we’ve decided to take the mine of one and blend it with the aerial glittering effect of another. This is how much control we have over the fireworks. I can’t give any specific details as some of this is commercially sensitive information; I’ve been sworn to secrecy! A lot of people ask me if we customise or design fireworks for import – this is exactly what is going on in this meeting. As this particular group imports shop goods and is the largest importer of professional (Category 4) fireworks to the United Kingdom, what you see in the shops and at many UK professional displays in late Summer and Autumn 2015 will be a direct result of this meeting. My tour of Liuyang is taking in several firework manufacturers and I’ve been whisked away to at least one factory each day already. It may surprise you that this actually is a first for me; I’ve been wanting to go to a firework factory for many years but have never been able to manage (nor afford!) a visit. As suppliers to the UK market, the manufacturers are keen for industry members to see where and how their products are made, especially if their factory has a new bit of automated equipment or some new facilities. As you’d expect, most places ensure we see the showroom areas, award cabinets and certificates, but with a little bit of persuasion, two factories did allow us to visit what we call the powder lines. This is where the powders, the key ingredients such as black powder, are made. We also saw some stars being rolled in a copper-like cement mixer. Why copper? Easy! It is non-ferrous and is not at risk of creating any sparks. Sparks, in whatever shape or form, are generally bad news in a firework preparation area. Star rolling and powder milling are the higher-risk stages of manufacturing. As a result, these work areas are often tucked away in the hills, well away from the rest of assembly lines on the factory site. 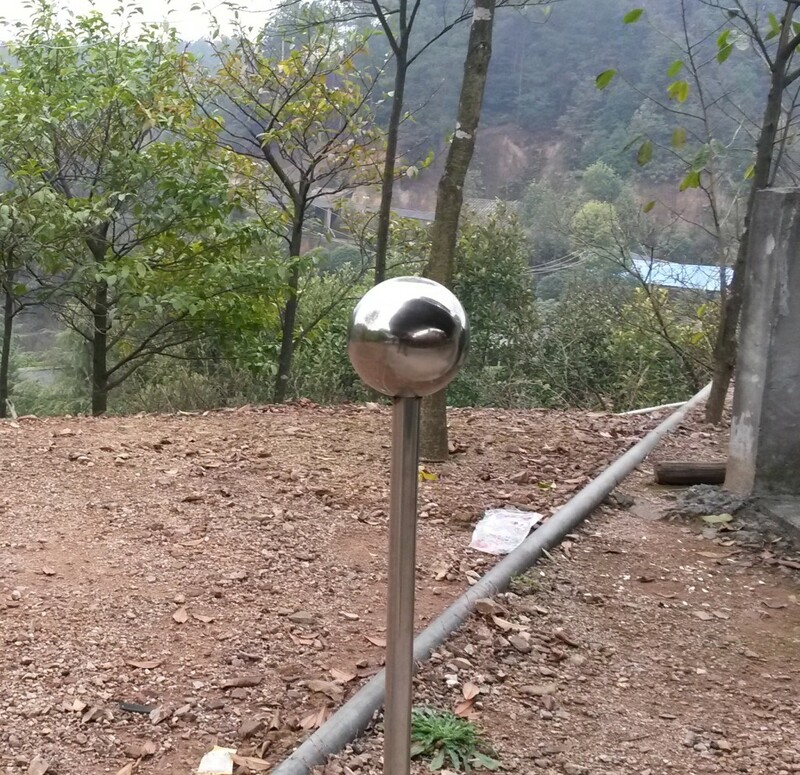 The factories do have earthing spheres on poles at regular intervals around the site. The idea is that you touch the balls to remove any residual charge before entering a preparation or storage area. Finally, you know you’ve spotted something brand new and cutting edge if the Chinese experts get excited when showing it. 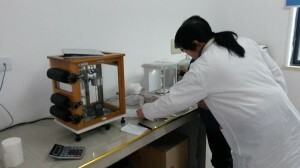 One such example was a new automatic cake fusing machine. 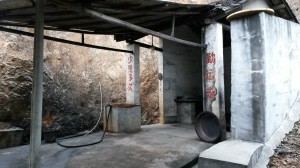 Even our interpreter and agent for the tour had never seen this before. It essentially works like a giant sewing machine, punching holes in the bottom of tubes, threading through string fuse, stacking the tubes and then taping them together to form a cake. 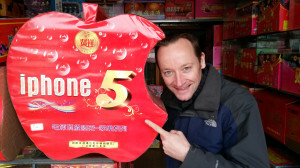 This is a very exciting week as I am in Liuyang, the home to Chinese firework manufacturing for almost 1500 years! I am here as part of a trade visit – several firework companies are here to view and order brand new materials for the UK display and retail markets. The visit combines tours of factories to see fireworks being made, followed by demonstrations – a combination of new customised product requests from us and new products that the Chinese are developing. 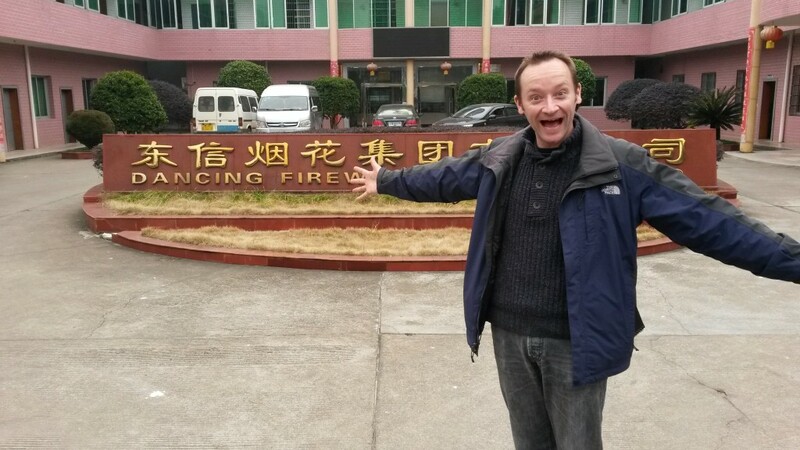 On day one, I had an opportunity to do a little bit of filming from the centre of Liuyang to give a brief flavour of what this place is like. And yes, several of you on Twitter have already said that I look like a child in a sweet shop! It is an extraordinary place.